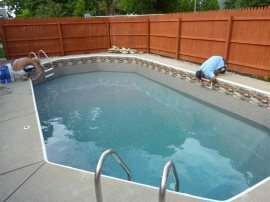 Vinyl Liner inground swimming pools come in all shapes and sizes. 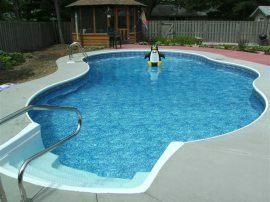 At Penguin Pools, we offer pricing on 17 unique vinyl liner pool designs, from simple Rectangle to a free-form Lagoon. 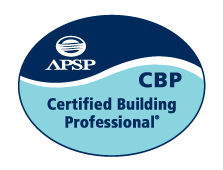 And, if you have a custom design, we can produce a design and quote quickly. 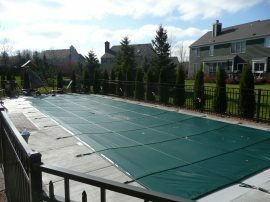 While other Southeastern WI companies might charge you extra for a custom dig or vinyl liner pool layout, we welcome the challenge. Feel free to contact us at any time for any and all dig specs. 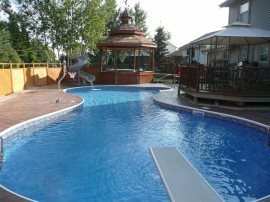 Best of all, if you have a custom design or layout, let us know and we will have our designer bring your inground swimming pool to life. 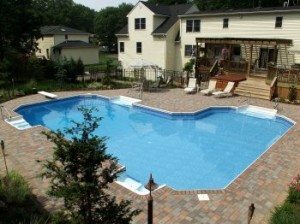 In order to be up-front and honest, we publish exactly what our standard vinyl liner inground pool package contains. 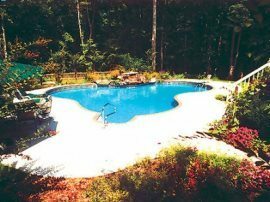 We want to make sure you know exactly what you’re getting with a Penguin Pool; what is included and what isn’t included in the base prices of each of vinyl liner swimming pools. 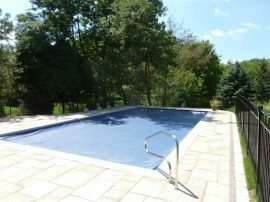 View our standard vinyl liner inground swimming pool package. Simple, classic and your best bang for your buck. Great for Auto Covers. The Mexico Pool design is a combination of a Lazy L and a Grecian Lazy L. It’s a true showstopper. 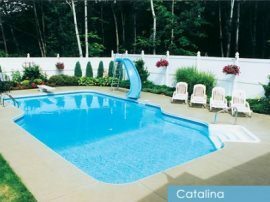 The Catalina Swimming Pool is a Rectangle Pool with a deep end jut-out, giving it some style. The Figure 8 Swimming Pool is designed with no straight walls and looks like the #8. 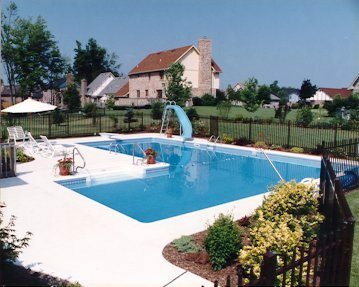 The Lazy L Swimming Pool is a Rectangle Pool with the deep end skewed on a 45 degree angle. The Grecian Lazy L Swimming Pool is a Lazy L with the Corner of the Pool “Clipped Off”. 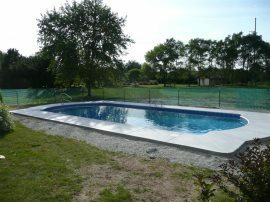 The True L Swimming Pool is a Rectangle Pool with an additional shallow area and looks like an “L”. The Grecian True L Swimming Pool is the same as a True L but with the corners clipped off. 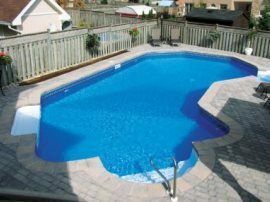 The Lap Pool is a narrow, long Rectangle Pool that’s perfect for swimming laps. The Double Lazy L Swimming Pool is Two Lazy L Pools with an island in the middle. 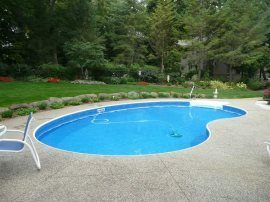 The Straight Kidney Swimming Pool deep end flairs out with a radius, making it look like a kidney bean. A Curved Kidney Swimming Pool is a pool without straight walls & radiuses to look like a kidney bean. The Tee Swimming Pool has a horizontal rectangle shallow end making it look like the letter “T”. 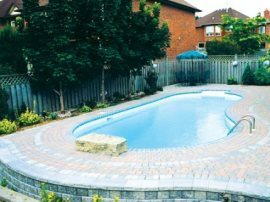 The Oasis Swimming Pool is an Oval with the middle “pushed in” to make it a pure free-form pool. The Double Roman Swimming Pool is a Rectangle Pool with “Half Moons” at the ends. The Lagoon Swimming Pool is a completely free-form pool that is sure to WOW anyone. 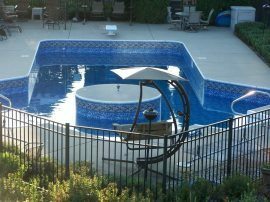 If you don’t see the style or shape that interests you, contact us and we will create your custom pool for no additional charge! 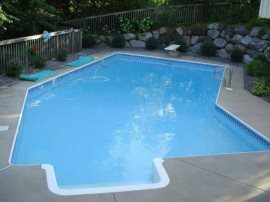 The Grecian Rectangle Pool is a rectangle pool with the corners “Clipped”.